When you want the best of the best, you can expect to pay a bit more than you would to buy a regular blender. Consequently, you have to shop a little more carefully to find something that will suit your needs. These fantastic blenders are perfect for restaurants, or if you just want a high-quality home appliance for all your smoothie needs. So let's have a look at some of the most expensive blenders. 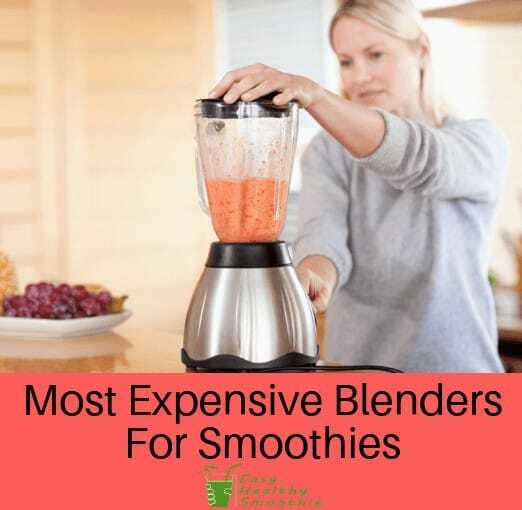 If you're looking for a high-quality option that is one of the more budget-friendly blenders on this list, this is an ideal option. Spec 2: Can contain up to 61 ounces. This blender allows you to use a powerful, large blender for a wide variety of foods without paying the highest price out there. It is one of the more expensive options, but it's the most budget-friendly in this list. It's able to hold up to 61 ounces, so you'll have plenty to save or share as you wish. Alongside the purchase, you'll also get a year-long warranty to protect your investment. For those who want very effective preset programs, this is a perfect choice. For a great smoothie, all you have to do is add your ingredients and push the smoothie button. Once you're finished, you'll also find that it's very easy to clean. The vast majority of users are perfectly happy with this product, though some experience some issues. The motor can be prone to overheating and can give off an unpleasant odor. Some customers also have issues with getting customer service to assist with issues that involve the warranty. While this is the most expensive option on this list, it has an extremely powerful motor and a lot of great reviews. Spec 1: Powerful 4.2-hp motor. Spec 2: Either 64- or 192-ounce containers. Spec 3: Heavy-duty, powerful device. Not only is this an extremely powerful option, it's also able to make very large amounts of smoothies, salsas and whatever else you need. That makes it perfect for those who like to make and save foods or share with larger groups. It's a heavy-duty device that will be able to handle just about anything you throw at it. With a 4.2-hp motor and up to 192 ounces of space for mixing, it's hard to go wrong with this device! For those who own restaurants or have other high-use situations, this is a fantastic option. It also allows for a great level of control so that everything that goes into the blender comes out perfectly. Furthermore, it's extremely powerful and able to blend just about anything. One of the most concerning aspects of this device is the lack of easily-available warranty information. Make sure you know what to expect from the warranty before purchasing. Furthermore, some aspects may be less powerful than some users can expect, which can be somewhat frustrating. If you're looking for a lot of power and durability, this blender is an ideal choice. Spec 1: Motor provides 1.5-hp of power. Spec 2: Contains up to 64 ounces. While it may not be quite as powerful as some other options on this list, this blender still offers 1.5 hp of power which will be able to handle just about anything you put into it. You'll also be able to make up to 64 ounces of smoothies or other recipes that you can save or share with others. Furthermore, the one-year warranty will keep you protected during normal use. It's an option most people find to be easy to use and highly efficient for daily smoothie needs. This blender is a truly powerful option, so you won't need to worry about it leaving food items unblended. It grinds easily and doesn't take too long for most users to learn. Overall, it's a durable, reliable device that is typically well worth the cost you pay for it. While most people can figure out how to use this blender pretty easily, there is a little bit of a learning curve. The blender can fall off the base, so it isn't ideal for those who don't have the strength to keep it in place. If you like a reliable option with a cool retro look, this is a fantastic option to look into. Spec 1: Provides 11.5 amps of power. Spec 2: Can hold up to 64 ounces. For those who prefer household appliances that offer a decent warranty, the Vita-Mix offers a three-years warranty just in case anything should go wrong during normal use. It's also a very powerful option, with a solid 11.5 amps to offer for all of your blending needs. For those who need to make larger amounts, it holds up to 64 ounces of whatever you need. If you appreciate simplicity, it also has simple controls and lets you set the perfect speed. This is a durable, powerful option that should last for years. If you're going to spend a decent chunk of money on a blender, you want it to last! On top of that, it's a choice that includes a longer warranty than many other options out there. Some users experience issues with the device turning itself off when struggling with ice cubes. There can also be customer service issues when trying to get help with the product. Consequently, it's worth considering closely before buying. If you want a quality blender that acts like a tiny robot in your home, the HBH850 is a great choice. Spec 1: Uses a 3-hp motor. Spec 2: Holds 64 ounces. If you're looking for power and durability, this is a fantastic choice. It can hold 64 ounces and has a 3-hp motor so it can blend just about anything. From the pre-programmed cycle options to the automatic shutoff to keep everything safe, it's hard to go wrong with this device. On top of that, you'll also get a warranty that lasts for two years to assist with keeping your investment safe. This is truly a powerful option that will be able to handle whatever you put into it with ease. There are very few complaints about its performance, and it's somewhat resistant to rust so you won't need to worry too much about it being destroyed by the use of liquid. Some users find this blender more difficult to clean than other options. In other instances, the pitcher can leak. Sometimes, the bottom may also be more prone to rusting than usual, so make sure to keep an eye out if you try this one. The Waring HGBSS is the most highly-rated option on this list. It provides a lot of power at a price that is a bit lower than some other options out there. While it's still an expensive model, it's one that many customers enjoy using a lot. If you're looking for something a little different, then the other options in this list are also worth a look. Make sure you compare them carefully and you'll be able to find the blender that suits your needs perfectly. It's also a good idea to take a look at the available warranties!